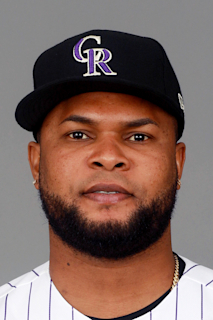 Married Ironelis … has one daughter: Melanny... Twitter: @AlexanderColome … Instagram: @ alexcolome37 ... His uncle is former major-league pitcher Jesús Colomé, who pitched for Tampa Bay (2001-06), Washington (2007-09), Milwaukee (2009) and Seattle (2010)... Is a close friend of fellow Dominican and All-Star reliever Fernando Rodney... Nickname is "El Caballo," meaning "The Horse." American League Leaders: 3rd-Holds (30)... Combined to go 7-5 with a 3.04 ERA (23 ER/68.0 IP), 30 holds, 12 saves and 72 strikeouts over 70 appearances between Tampa Bay and Seattle... Became the first pitcher in major-league history to record at least 10 saves and 30 holds in a season... Was traded by the Rays with OF Denard Span and cash considerations to the Mariners on 5/25 in exchange for RHPs Andrew Moore and Tommy Romero... Was 5-0 with a 2.53 ERA (13 ER/46.1 IP), all 30 holds and 49 strikeouts over 47 appearances with the Mariners … the 30 holds were the second-highest total in Mariners history behind Arthur Rhodes (32, 2001)... Did not record his first hold of the season until 5/28... Recorded a 1.51 ERA (6 ER/35.2 IP) with 40 strikeouts in 37 games at home (11 at Tropicana Field and 26 at Safeco Field)... Limited lefties to a .171 average (19-111), compared to a .274 mark (40-146) vs. right-handers...Converted 11 of 13 save opportunities with the Rays … at the time of the trade, ranked fourth in the AL in saves...Earned a save in four straight outings from 5/14-19, including three consecutive days (5/14-16)...Registered the save in a perfect ninth inning in his Mariners debut on 5/27 vs. Minnesota... In his 47 games with Seattle, allowed at least two runs five times but just one run total in the other 42 outings … the club went 41-6 when he made an appearance... Recorded a streak of 20.0 consecutive scoreless IP from 6/30-8/15, the sixth-longest in history by a Mariners reliever behind Shigetoshi Hasegawa (28.2 IP), Tom Wilhelmsen (24.0 IP), Edwin Núñez (24.0 IP), Charlie Furbush (22.2 IP) and J.J. Putz (22.0 IP)... Finished the season on a 10-game scoreless streak from 9/3-29 (10.0 IP). Became the first pitcher in franchise history to lead the majors in saves…his 47 saves were 6 more than any other pitcher in the majors (COL Greg Holland, LAD Kenley Jansen), the largest cushion over second place since 2008, when LAA Francisco Rodríguez (62) was followed by HOU José Valverde (44)…posted 8 saves more than any other AL pitcher (TOR Roberto Osuna)... His 47 saves ranked 2nd for a single season in franchise history and were one shy of Fernando Rodney's club record (48 in 2012).... Joined Brad Boxberger (2015) and Rafael Soriano (2010) as Rays closers to lead the AL in saves.... Led the AL with 6 saves of 4 outs or more.... Entered the All-Star break with 25 saves, one shy of Roberto Hernández's club record for the first half (26 in 1999).... Pitched to a 2.15 ERA (29.1-IP, 7-ER) over his last 30 apps, from July 6 through the end of the season…this stretch lowered his season ERA from 4.10 to 3.24 and came on the heels of allowing 10 runs in a 5-game stretch spanning 5 IP.... Allowed at least 1 hit in 14 consecutive apps from May 31-July 9, the longest such streak by a Rays reliever since Travis Harper (21) from April 20-July 6, 2006.... On July 27 at NYY, was charged a blown save after allowing a leadoff triple in the 9th inning and a 2-out, game-tying single between the shifted middle infielders... Named AL Reliever of the Month for August, after going 10-for-10 in save chances with a 0.75 ERA (12-IP, 1-ER) over 12 apps.... On Sep 15 vs. BOS, snapped a season-long streak of 15 successful save opportunities…gave up 3 runs in the 9th inning to lose a 5-2 lead in the eventual 13-6, 15-inning loss... Made his second consecutive Opening Day roster (started the 2015 season on the disabled list)… on April 2 vs. NYY, became the first Ray in club history to record a save on Opening Day....WORLD BASEBALL CLASSIC: Pitched for the Dominican Republic in the World Baseball Classic during spring training, going 1-0 with a 4.15 ERA (4.1-IP, 2-ER) in 5 apps…earned the win over Team USA by working a scoreless 8th inning, and in the bottom half the D.R. rallied for 4 runs to win it, 7-5. Emerged as the Rays closer and was named to his first All-Star Team as Brad Boxberger battled injuries…converted 37 of 40 save chances (92.5 pct. ), ranking tied for 4th in the AL in saves and 5th in the majors in save pct. …became the Rays 11th different save leader in the last 12 seasons. Compiled a 1.91 ERA (56.2-IP, 12-ER), becomingthe third in Rays history to record 35-plus saves and a sub-2.00 ERA…joined Fernando Rodney (48, 0.60) in 2012 and Rafael Soriano (45, 1.73) in 2010-both fellow Dominicans. Did not allow a run in his 37 apps ending with a save, the first pitcher to record that many saves without yielding a run in those outings since ATL Craig Kimbrel (46) in 2011…his 1.36 ERA in save situations (39.2-IP, 6-ER) ranked 2nd in the majors (min. 20 save opps) to BAL Zach Britton (0.38)…pitched to a 3.18 ERA (17-IP, 6-ER) otherwise. Earned the save in 37 of the Rays 68 wins (54.4 pct. )…according to the Elias Sports Bureau, Colomé was the first pitcher to save 4 straight team games three times in a season since LAD Éric Gagné in 2003-the year he won the NL Cy Young Award…Colomé turned the trick May 4-8 (with off-day), June 3-6 (without off-day) and July 27-31 (with off-day)…prior to Colomé, it had been done only once in Rays history, by Rafael Soriano (July 3-6, 2010). Converted his first 21 consecutive save opportunities, a club record to begin a season (prev. 16, twice, last Rafael Soriano in 2010)… it fell one shy of Fernando Rodney's club record at any point in the season (22, May 27-Aug 13, 2012). On April 5 vs. TOR, was on the mound (and earned the victory) when the Rays won on the new slide rule 6.01(j)…José Bautista used his hand to deter 2B Logan Forsythe from turning a double play, changing Toronto's would-be 4-3 lead into a 3-2 Rays win. Earned his first career save on April 17 vs. CWS in his 400th professional app. Yielded a 3-run homer to Troy Tulowitzki on May 1 vs. TOR, snapping a 69-inning homerless streak dating back to 2015. His 3 blown saves came on July 23 at OAK, Aug 26 at HOU and Oct 2 at TEX…yielded 2 HR in each of those first 2 outings…on July 23, gave up home runs to Jake Smolinski and Ryon Healy (walk-off)…on Aug 26, gave up back-to-back home runs to Carlos Correa and Evan Gattis (walk-off), the first time in franchise history a game ended on back-to-back home runs by the opponent. Converted all 16 of his save chances at Tropicana Field…was one of four relievers with-out a blown save at home (min. 10 saves), joining BAL Zach Britton (26-26), MIA A.J. Ramos (18-18) and BOS Craig Kimbrel (16-16). Six of his saves required 4 outs or more, tying TOR Roberto Osuna for most in the majors and the most by a Ray since Danys Baez in 2005 (10). Made 19 consecutive scoreless apps spanning 21 IP from May 4-June 15. Placed on the 15-day DL on June 28, retroactive to June 19, due to right medial biceps tendinitis…reinstated on July 5…went more than a month between saves (June 14 vs. SEA and July 17 vs. BAL) as the Rays went through a 3-24 slump. ALL-STAR GAME: Did not pitch following his selection by Royals Manager Ned Yost…was the first selection of his career and the seventh reliever in club history selected…it marked the seventh straight year the Rays had a pitcher make it. Was one of only three major league pitchers to make 12 or more starts and 30 or more relief appearances, joining ARI Josh Collmenter and MIN Trevor May...his 8 wins tied May for 3rd among AL rookies...did this despite missing the first month of the season recovering from pneumonia…With Alex Cobb, Matt Moore and Drew Smyly on the disabled list, he entered the rotation and won his first 2 starts: May 1 vs. BAL (2-0) and May 6 at BOS (5-3)...pitched 5 innings both times...won only once in his next 11 starts and was moved to the bullpen in early July to accommodate the return of Matt Moore...remained there the rest of the season…In 13 starts was 3-4 with a 4.70 ERA (69-IP, 24-BB, 44-SO)...in 30 relief apps was 5-1 with a 2.66 ERA (40.2-IP, 7-BB, 44-SO) and did not allow a home run. Saw an increase in velocity after moving to the bullpen on July 7, according to PITCHf/x data...his average fastball went from 93.8 to 94.7 mph, while his slider jumped from 86.8 to 88.8 mph…Recorded a 0.29 ERA (30.2-IP, 1-ER) over a two-month span of 21 apps (July 17-Sep 15)...yielded only 18 hits and 5 walks while striking out 34...was 3-0 with 7 holds…His hot streak ended on Sep 17 vs. BAL, when he inherited a 3-0, 8th-inning lead and allowed 4 runs in a 4-3 loss...went on to become the first pitcher in Rays history with 5 blown saves in a calendar month, and the first pitcher to do it in the majors since LAA Jose Arredondo in August 2008...he suffered 4 blown saves in his final 7 appearances…Didn't allow a home run after WAS Clint Robinson took him deep on June 16...went his final 60.2 innings without allowing a HR...among all major league pitchers, only STL Adam Wainwright finished the season with a longer streak (61.0)…On June 21 at CLE, threw a career-high 7 innings but earned no decision in an eventual 1-0 loss (1-H, 0-R, 2-BB, 4-SO, 87 pitches, 49 strikes)...retired his first 16 batters in order before yielding an infield single to Michael Bourn in the 6th...it was the 2nd-longest perfect game bid in Rays history at the time, behind Matt Garza (April 30, 2009 vs. BOS), whose perfect game bid was also spoiled on an infield single, by Jacoby Ellsbury leading off the 7th inning...Chris Archer retired the first 19 BF on July 29 vs. DET...Kevin Jepsen lost in the 9th on a walk-off sac fly by David Murphy. Entered the 2015 season rated by Baseball America as the Rays top pitching prospect, and No. 4 overall, behind OF Steven Souza Jr., INF Daniel Robertson and SS Willy Adames...the publication also tabbed him as having the Best Fastball in the system…After the season, made 8 relief appearances for Leones del Escogido, helping them win their fourth Dominican Winter League championship in seven seasons...his teammates included Enny Romero and Taylor Motter. Appeared in 5 games (3 starts) over three tours with the Rays...made a pair of one-day stints (May 26 and June 27) and was recalled Sep 15 through the remainder of the season...Yielded only 1 run in his 3 starts, going 2-0 with a 0.48 ERA (18.2-IP, 12-H, 1-ER)...the lone run came in his first inning as a starter, and after that threw 17.2 scoreless as a starter...as a reliever, had a 10.80 ERA (5-IP, 6-ER) in 2 games...Is 3-1 with a 1.30 ERA (34.2-IP, 5-ER) in 6 career starts, and hasn't allowed a run in 4 of those...On Sep 15 vs. NYY, went a career-high 6.2 innings and threw a career-high 113 pitches but received no decision...Rays won, 1-0, in the 9th on a Ben Zobrist single...on Sep 27 at CLE, threw 6.1 scoreless innings to beat Carlos Carrasco, 2-0...After he was optioned to Triple-A Durham in spring training, missed the first 50 games of the season while serving a suspension for a violation of Major League Baseball's Joint Drug Prevention and Treatment Program...made 3 rehab starts for Class-A Charlotte prior to being reinstated from suspension...Made 2 starts for Durham in the postseason...started 6 games for Escogido in the Dominican Winter League...Enters the 2015 season rated by Baseball America as the Rays top pitching prospect, and No. 4 overall, behind OF Steven Souza Jr., INF Daniel Robertson and SS Willy Adames...the publication also tabbed him as having the Best Fastball in the system. Began the season as Triple-A Durham's No. 2 starter, but made 3 starts for the Rays over two tours (May 29-30 and June 22-29)... After his last start with the Rays, a 6-3 loss to the Tigers on June 28-the only start of his 3 with the Rays in which he allowed an earned run-he was shelved the rest of the season with a right elbow strain…was the second consecutive season he suffered a season-ending injury... Originally called up on May 29 to pitch out of the bullpen but started the next night at Miami when Alex Cobb suffered a cut on his right middle finger... Defeated the Marlins, 5-2 (5.2-IP, 5-H, 1-R, 0-ER, 2-BB, 7-SO) and became the seventh in Rays history to win his major league debut as a starter and first since Jeremy Hellickson, Aug 2, 2010 vs. MIN…also became the second in Rays history to make his major league debut as a starter and allow no earned runs (Scott Kazmir, Aug 23, 2004 at SEA)…became just the 12th AL pitcher since 1916 to allow no earned runs and record at least 7 SO in his major league debut, and first in more than 11 years, since OAK Aaron Harang did it on May 25, 2002 vs. TB (10-SO)... Did not allow an earned run in his first 2 starts, the first pitcher to do that since SF Ryan Sadowski in 2009... Won only once in his first 7 starts for Durham despite a 3.13 ERA while the Bulls scored a combined 9 runs while he was on the mound…then won his next 3 starts before the call-up to the Rays on May 29…at the time was 2nd in the International League in strikeouts (61 in 55.1 innings)... Rated the No. 5 prospect in the Rays system by Baseball America following the season, up from No. 8 entering the year. Split the year between Double-A Montgomeryand Triple-A Durham, combining to go 8-4 witha 3.44 ERA (91.2-IP, 35-ER) in 17 starts...earnedan Aug 3 promotion to Durham, where he went0-1 with a 3.24 ERA (16.2-IP, 6-ER) in 3 starts...After his Aug 13 start with Durham missed the remainder of the season with right shoulder tightness...Named MVP with Montgomery, where he went 8-3 with a 3.48 ERA (75-IP, 29-ER) and 75 SO in 14 starts...was on the DL from April 12-May 26 with a left oblique injury...Named Rays Minor League Pitcher of the Month for July after going 5-1 with a 2.23 ERA (40.1-IP, 10-ER) in six starts...over his final 5 starts with the Biscuits, went 5-0 with a 1.27 ERA (35.1-IP, 5-ER)...threw the first 9-inning complete game of his career in his final start before his promotion, allowing just 2 runs in a 5-2 victory vs. Mississippi (Braves)...Allowed 3 ER or less in 15 of his 17 total starts...In spring training, spent his first time in major league camp...made 3 appearances, allowing 1 run in 4 IP...was optioned to Triple-A on March 15...Enters the 2013 season ranked as the Rays No. 6 prospect by Baseball America. Split the season between Class-A Charlotte and Double-A Montgomery...combined to go 12-9 with a 3.82 ERA (157.2-IP, 67-ER)...his 12 wins tied for 2nd most among Rays minor leaguers...157.2 IP ranked 2nd behind Matt Moore...Began the season with Charlotte...held opposing batters to a .214 (78-for-365) avg. over his 19 starts...won 8 of his last 9 starts with the Stone Crabs, boasting a 1.82 ERA (54.1-IP, 11-ER) in that span...named a Florida State League midseason All-Star and his 92 SO ranked 6th in the FSL at the time of his promotion...Promoted to Montgomery on July 23 and made 9 starts there to finish the year...held left-handed batters to a .143 (11-for-77) avg. ...recorded a 1-hit shutout (7 innings) on Aug 9 vs. Mobile...Ranked as the No. 5 prospect in the Rays farm system by Baseball America entering 2012. Spent the majority of the 2010 season with Class-A Bowling Green and made 1 start with Charlotte to end the season...on the year, went 6-6 with a 3.89 ERA (118-IP, 51-ER) and 126 SO...Had the 2nd-highest SO/9 IP ratio in the Midwest League (9.32) and was named to the MWL midseason All-Star Team...ranked as the No. 9 prospect in the Rays system by Baseball America after the season...Participated in the Rays Winter Development Program at Tropicana Field after the season. In 2009, led the Rays organization and ranked 2nd in the New York-Penn League in ERA as he went 7-4 with a 1.66 ERA (76-IP, 14-ER)...led the NYPL with 94 SO and tied for the league lead with 2 CG...was named the Rays Minor League Pitcher of the Month for July...Entered the season ranked as the No. 24 prospect in the org. by BA and climbed to No. 8 on the list after the season...was named the No. 2 prospect (and top pitching prospect) in the NYPL by BA. November 30, 2018 Seattle Mariners traded RHP Alex Colome to Chicago White Sox for C Omar Narvaez. May 27, 2018 Seattle Mariners activated RHP Alex Colome. May 25, 2018 Tampa Bay Rays traded RHP Alex Colome, LF Denard Span and cash to Seattle Mariners for RHP Andrew Moore and RHP Tommy Romero. July 5, 2016 Tampa Bay Rays activated RHP Alex Colome from the 15-day disabled list. June 28, 2016 Tampa Bay Rays placed RHP Alex Colome on the 15-day disabled list retroactive to June 19, 2016. Right medial biceps tendinitis. May 1, 2015 Tampa Bay Rays activated RHP Alex Colome from the 15-day disabled list. April 21, 2015 Tampa Bay Rays sent RHP Alex Colome on a rehab assignment to Durham Bulls. April 11, 2015 Tampa Bay Rays sent RHP Alex Colome on a rehab assignment to Charlotte Stone Crabs. September 15, 2014 Tampa Bay Rays recalled RHP Alex Colome from Durham Bulls. June 28, 2014 Tampa Bay Rays optioned RHP Alex Colome to Durham Bulls. June 27, 2014 Tampa Bay Rays recalled Alex Colome from Durham Bulls. May 27, 2014 Tampa Bay Rays optioned RHP Alex Colome to Durham Bulls. May 26, 2014 Tampa Bay Rays recalled Alex Colome from Durham Bulls. May 25, 2014 Tampa Bay Rays optioned RHP Alex Colome to Durham Bulls. May 25, 2014 Tampa Bay Rays reassigned RHP Alex Colome to the minor leagues. May 5, 2014 sent RHP Alex Colome on a rehab assignment to Charlotte Stone Crabs. March 24, 2014 Durham Bulls placed RHP Alex Colome on the restricted list. March 24, 2014 Tampa Bay Rays placed RHP Alex Colome on the restricted list. March 8, 2014 Tampa Bay Rays optioned RHP Alex Colome to Durham Bulls. November 4, 2013 Alex Colome roster status changed by Tampa Bay Rays. August 30, 2013 Tampa Bay Rays placed RHP Alex Colome on the 60-day disabled list. Right elbow strain. July 12, 2013 Durham Bulls placed RHP Alex Colome on the 7-day disabled list. June 29, 2013 Tampa Bay Rays optioned RHP Alex Colome to Durham Bulls. June 22, 2013 Tampa Bay Rays recalled Alex Colome from Durham Bulls. May 31, 2013 Tampa Bay Rays optioned Alex Colome to Durham Bulls. May 29, 2013 Tampa Bay Rays recalled Alex Colome from Durham Bulls. March 11, 2013 Tampa Bay Rays optioned Alex Colome to Durham Bulls. October 4, 2012 Tampa Bay Rays recalled Alex Colome from Durham Bulls. September 4, 2012 Alex Colome roster status changed by Durham Bulls. August 22, 2012 Durham Bulls placed RHP Alex Colome on the 7-day disabled list. August 2, 2012 RHP Alex Colome assigned to Durham Bulls from Montgomery Biscuits. May 26, 2012 Alex Colome roster status changed by Montgomery Biscuits. April 12, 2012 Montgomery Biscuits placed RHP Alex Colome on the 7-day disabled list. March 15, 2012 Tampa Bay Rays optioned RHP Alex Colome to Montgomery Biscuits. November 18, 2011 Tampa Bay Rays selected the contract of Alex Colome from Montgomery Biscuits. July 21, 2011 Alex Colome assigned to Montgomery Biscuits from Charlotte Stone Crabs. October 24, 2010 RHP Alex Colome assigned to Leones del Escogido. October 24, 2010 Leones del Escogido activated RHP Alex Colome. September 1, 2010 Alex Colome assigned to Charlotte Stone Crabs from Bowling Green Hot Rods. August 16, 2010 Alex Colome roster status changed by Bowling Green Hot Rods. July 28, 2010 Bowling Green Hot Rods placed RHP Alex Colome on the 7-day disabled list. April 5, 2010 RHP Alex Colome assigned to Bowling Green Hot Rods from Hudson Valley Renegades. June 19, 2009 Alex Colome assigned to Hudson Valley Renegades from Princeton Rays.